New York, NY (CHELSEA) Garvey|Simon is pleased to announce the exhibition, Sandy Litchfield: Deciduous Cities, featuring new work from three recent series: Around Town, Forest/City and Rome (Eternal Cities). This is the artist’s first solo exhibition at Garvey|Simon and her first solo show in Manhattan. A full color catalog with essay by Mary M. Tinti, Ph.D. (Curator, Fitchburg Art Museum) accompanies the show. Litchfield’s early abstract paintings were based on her memory of walks through the countryside. In her recent work, she samples elements not only from walks, but also historical representations of landscape, nineteenth century pictorial maps and speculative architectural design. These new paintings appear more representational than Litchfield’s earlier work, but they still focus on topography, perspective and the arrangement (or rearrangement) of the fragmented landscape. As in earlier work, some of Litchfield’s cityscapes have a stage-set quality. 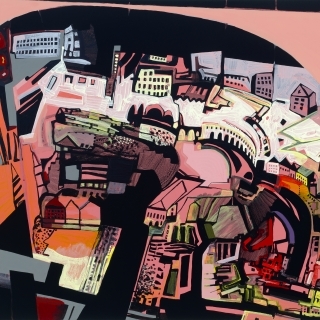 In Crush, 2016, from the Rome (Eternal Cities) series, a fragmented pink proscenium arch hangs over a jumbled night scene of Rome. Fleshy pink and orange buildings bubble and swell from the strata of ruins below, creating a Guston-ian vortex of classical Roman architecture. But they also take a pointed look at contemporary environmental concerns. In the large painting, Over and Under Growth, high-rise buildings spill up from one side of the painting, while a wild forest pushes through random architectural elements on the other. The varied surface of these paintings includes oscillations between the graphic silhouette and painterly impasto. The integration of imagery expresses both tension and harmony. The disorienting aerial views of coast and countryside are evident in Litchfield’s painting, Hook and Swill, 2016. Here a sweeping, bird’s eye view of swirling roadways, green fields, blue rivers, bulging mountains and interspersed buildings create a colorful field of pregnant abstract shapes and forms. 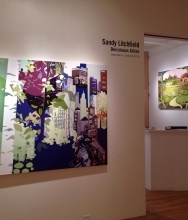 Litchfield’s fantastical landscapes with her bold use of color, cubist and abstract expressionist compositional elements, and quirky perspectives pay homage to several influencers: American modernist artists Charles Burchfield and Oscar Bluemner, abstract expressionist painter Philip Guston, and folk artist, Grandma Moses.